Last weekend we headed out of Dallas metro to an outdoor music venue called Bono’s Saloon. 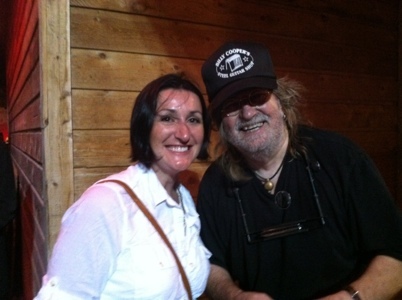 Waiting there for us was the legendary Ray Wylie Hubbard. I’m sure that you have figured out that we are fans of Americana and Texas county music from our song of the week selections. This rugged North Texas music venue was just the ticket for catching an artist that I am a huge fan of. You would think we would be able to see so many bands, moving around this much. Actually we usually miss the acts we like by just a few days. Knowing that we had such a large window in Dallas (two weeks) we put in some research time and looked at a long list of who we would like to see. Again most of the groups we were missing by a day or two but not all. Bono’s Saloon claims to be the North Texas home for Red Dirt music and pulls in some pretty good acts. Ray Wylie Hubbard is most well known for writing “Up against the wall, redneck mothers” and “Screw you, we’re from Texas”. Obviously with a tune like that you gather a Lone Star fan base. The venue was an outdoor stage area behind the restaurant and really felt like someone’s backyard. Not because it wasn’t nice but because everyone seemed to be friends. It would have been nice it the website had made it clear that you need to bring a chair. What made this venue so absolutely amazing was how close you can get to the stage, just a few feet from the legend. I am sure that the giddy smile on my face made it clear that I was in heaven. Hubbard is currently touring with his son and you can tell they are both enjoying it. It will be a long time before another concert is this good but hey who better to set the bar high?! 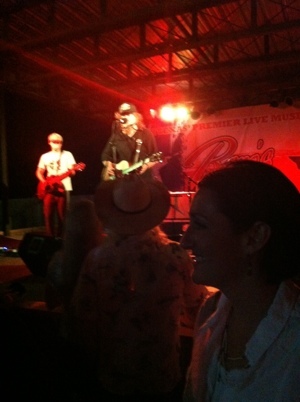 This entry was posted in Uncategorized and tagged Bonos Saloon, Live music, Ray Wylie Hubbard. Bookmark the permalink.